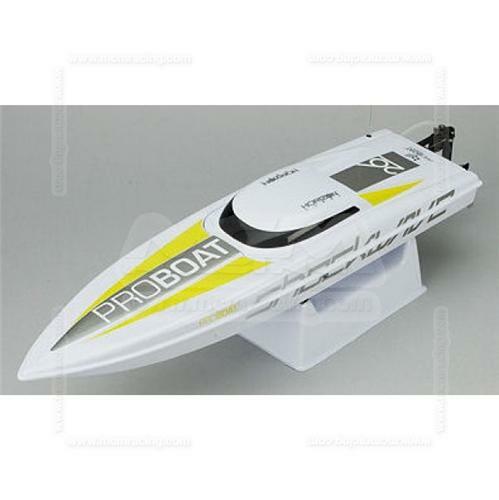 Here you have a Pro-Boat 26 PRB0600 Shockwave Deep V Electric R/C Racing Boat !! This exact kit would set you back $219.99 plus tax or shipping at any hobby outlet so pick this one up at a fraction of the retail price Now !! This kit will include the Complete Ready To Run Boat, Transmitter, Battery Pack, Charger, Owners Manual And Original Box !! Please understand that this package includes the Complete RTR Boat, Made By Pro Boat, 2.4Ghz Spektrum Series Transmitter & Receiver 7.2 Volt Ni-Mh Battery Pack, (4) AA Batteries For The Transmitter, Charger, Owners Manual And Original Storage Box !! You can open box charge and install on-board battery pack and you are ready to race !! You can't go wrong here when you will receive a Brand New Racing Boat, you have a Low Purchase Price Of Only $189.00 and if you buy it now, you can receive it in just a "few days" !!! So take advantage of this limited time offer and add one of these Great Racing Boats To Your Fleet Now !!! This is a Brand New Teriffic Boat and there is only this one available at this Great Price !! Review all photo's to see & Buy It Now Or Loose Out !! !!! Here is an opportunity to get one of these Great Boats at a Great Price That Is 100% Ready to Run So Buy Now And Save !! OK, so Thank You For Looking At My Item And Please check my other "BUY IT NOW OFFERS" for More R/C Boats, Cars, Trucks, Crawlers, Buggies, Truggies, Helicopters, Planes, Parts, Upgrades, Accessories And Many More Great Deals !! Complete RTR including a 6-cell Ni-MH battery and peak charger. Includes Pro Boat® 2.4GHz marine radio system. Includes Dynamite 6-cell Ni-MH battery and peak charger. Built to deliver better handling and performance than anything else in its price range, the ShockWave® 26 brushed RTR Deep-V comes packed with a powerful 550-size, water-cooled motor that propels it through the water at surprisingly fast speeds.